What’s even better than seeing those maniac bus drivers crash into parked cars here? If you’re thinking “gunfire in the street a few feet away from you”, you guessed correct! I’ll get to that in a little bit, but I just want to do a quick recap of my “tourist” week here in Rio. I had been planning to go to the statue with a bunch of people the coming Saturday, but on Thursday I was coerced by Katrina to go with her, Benedikta, and Ben to the Cristo. Coercing me is basically saying “Tim do you want to go (fill in the blank)”, but it sounds much better that way. We set off that afternoon and I also decided I would go back that Saturday. We had a nice lunch in Ipanema, and then off to the statue we went. Getting to Cristo Redentor isn’t that much of a problem, but from where I’m at in Barra a lot of Rio seems far away. We took a cab to Ipanema and then from there walked to the subway. This was my first time in the subway as well here. I actually think the subway trains and stations here are nicer than Chicago (not that I’m saying much with that comment). It was mid-day so it wasn’t very packed which surprised me. I figured at any given moment it would be crammed but it was actually comfortable. From the subway we had to take a bus to the base of the statue. To get to the top there are two routes you can take. The first day we took the tram. It’s a train that goes to the top and costs about R$36. It’s a neat little ride with some good views. The other route is taking a van half way up the mountain, and then take one of the National Park buses the rest of the way up. The view at the top where the statue resides is simply amazing. You can see almost all of Rio from up there. I really didn’t realize how big Rio de Janeiro is until I was looking at all of it from up there. The statue itself is a sight as well. I’d really love to share some of the views from that day with you, but unfortunately I can’t. I lost my camera on the way home from the statue. I believe it fell out in the cab on the way back. It’s a real downer, as I had some great pictures. In fact, it’s one of the few times I’ve taken my camera anywhere and it ends up getting lost. I try to think positive and I know electronics are really expensive here, so hopefully it went to some kid who could really use something nice. I’m pretty sure Katrina and Benedikta didn’t mind that my video of them doing the chicken dance will never be seen again though. As I was again trying to be positive, I figured that at least I’ll be heading back Saturday with a purpose. I did return and ended up in a lot of my friends’ pictures. Mikko was taking pictures for me as well. I’ll try to get those posted as soon as I can. On Saturday we actually went to Sugarloaf first which is another mountain. You take two cable trams to the top. The views there were pretty spectacular as well, but I would definitely recommend Cristo If you only want to do one or the other. After that we ate at a restaurant called Café Lamas. The restaurant has been in Rio since 1874. It’s kind of cool to eat at a place with so much history. The food was good as it is everywhere here. 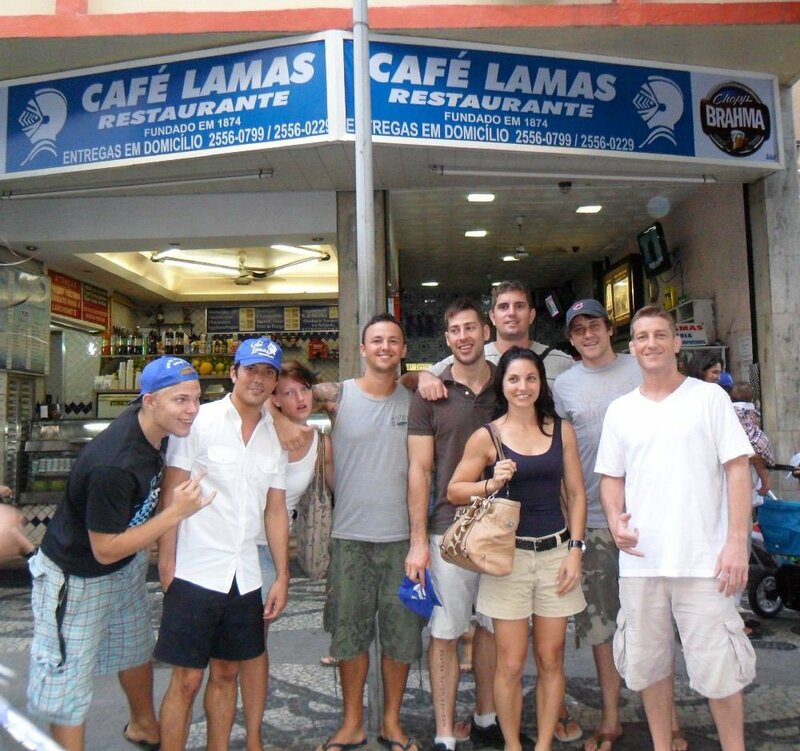 Below is a picture of the group at Café Lamas. Next we ventured on to the Cristo statue. It was actually pretty late at this point, so I got to see the statue at dusk and while it was a little bit dark. It’s like a different experience, and the view of Rio is great at night as well. This time we took the van and bus route up the mountain. It was actually quite a bit faster. After this it was back home to get ready for what would be quite the interesting night. I’ve been to a ton of bars, nightclubs, and parties here in Rio, but most of them have been in the Barra area. Carnaval I ventured out quite a bit, and we’ll occasionally head to Baixo Gavea, but usually I stick around here. Since it was Ben’s last weekend here, we decided to head to a place a few of them had been before called Rio Scenarium. I heard nothing but good things about the place, the only problem was it was in Lapa which is a bit of a hike. It was no problem though as I like to see as much of the city as I can. We took the bus to Ipanema, and while walking to the metro station I actually got to stop and eat McDonalds. It was the first time, and probably the last that I’ll have fast food in Rio. It’s not that it was bad. It was surprisingly authentic to the taste of McDonalds in the states. I’m just used to eating regular food now and I’ve seen the difference in my weight and body from not eating fast food. We left McDonalds and started walking to the metro, and then it happened. A man was running down the street with no shirt on and although I wasn’t paying great attention I think he maybe had no shoes on either. It was odd but I didn’t really think anything of it until I saw someone trailing him. It got even better when I noticed it was a police officer. At the same time I notice it’s an officer, I see he has his pistol unholstered and is running with it in his hand, finger in the trigger well. I think this would make most people feel pretty uncomfortable, but I was more interested in what he was going to do. I knew he was going to shoot, I could just tell by his body language. I knew I was a little ahead of everyone and was somewhat worried about where the guy ran to, but then I saw him point the pistol in the air at maybe a 45 degree angle from having it straight out in front of him. He fires one shot. I guess he doesn’t realize that the round has to come down, or really just didn’t care. It actually looked as though the angle might hit one of the buildings, but it’s hard to tell without being closer than I was. Speaking of which, I was pretty close. He was basically right off to the side of me when he shot the first round, although I was on the sidewalk and he was in the street. He kept running and I kind of just stood there. He fired another round, but I didn’t see if it was toward the guy or another warning shot. From here on, we just kept walking. There was no need to be a spectator for us. What did somewhat alarm me was the two officers, both with assault rifles moving up each side of the street in a sort of tactical run. I saw many police up ahead and started wondering if we were walking into something bigger than some shoeless thief being pursued. There were no problems ahead though, and we headed on to hit the train to Lapa. We went to two places here. The line for Rio Scenarium was insane, so we went into a bar across the street. We had a few drinks, and then headed up stairs to the nightclub there. It wasn’t a bad place, but it was somewhat small. A few people went home early and I don’t blame them as it was a super long day. I wanted to stay out so myself, Ben, Tim, Jenn, and JP made our way upstairs to the first club and then later off to Rio Scenarium. I really liked this place. It was a couple different levels, one of which you could actually sit down in and chat if you wanted to. I spent a lot of time talking to and meeting new people that night. All in all it was a good night, and definitely made this blog post a little more interesting. Training has been good as well. I didn’t make 10 classes last week, but I did hit 8 which is the low end of my goal. That equals out to about 12 hours of training a week which is pretty good, but I feel like I need to do more. I’m going to start adding runs into my schedule and try to do more pushups and pullups. I’m waking up at 6:45am tomorrow morning to run to the beach with Jonathan, and I’m going to do the mma/no-gi class tomorrow as well. I’m learning a lot, but I’m still getting pretty frustrated at times here. I’m almost always rolling with someone who is a higher belt than me, so I’m almost always not able to do what I want to do. I know I’m still learning a lot, but it’s mentally exhausting. It’s not deterring me though, and if anything it’s causing me to want to train harder. I was talking about this today in the afternoon session, and Ryan who is a brown belt really put it in perspective for me. He basically said that he’s frustrated all the time here too. If he’s been doing this as long as he has and he’s always frustrated, I have no room to talk. I just need to get more time on the mat. I haven’t posted it to the blog yet, so here is the link to the Real Rio episode where I am shown rolling at the Novo Leblon academy. Also below that is an episode filmed in an MMA class I was in last week. I hope you enjoy watching me being submitted! I should have another post sometime later this week as long as grad school doesn’t take every second of my time, and will include pictures from the Sugarloaf and Cristo trip there.